German: Czyticz; 864 inhabitants. Description of the coat of arms: Green - black divided shield; on top a winged railroad wheel; on the bottom per saltire two yellow miner hammers. Image from this website, spotted by Jarig Bakker, 3 Oct 2002. 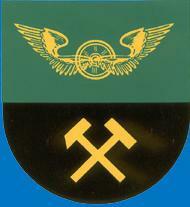 Description of the coat of arms: Green - black divided shield; on top a winged railroad wheel; on the bottom per saltire two yellow miner hammers.